On December 18, 2011 December 18, 2011 By AngeliaIn WINNING! Well….I’m not officially a Hardy as I have not yet changed my last name after marrying Jason, but I still consider myself a Hardy. It’s not easy changing all those government documents and emails, yo. For the first time in a long time, we are kid-less on a Sunday. So, what do we do? 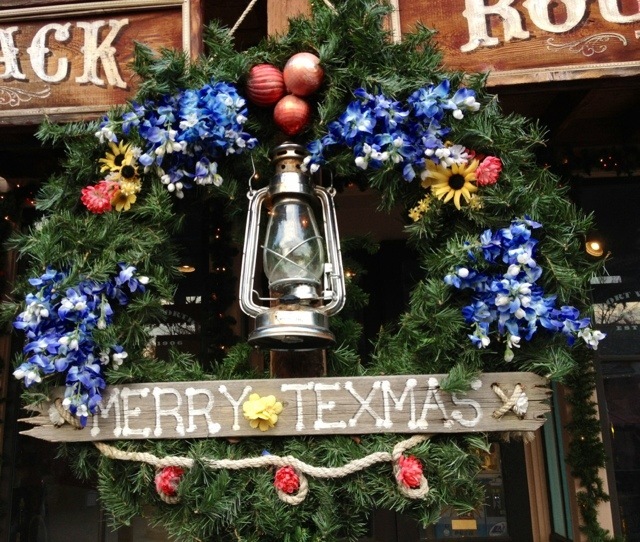 Go to a place where we can be kids – Six Flags over Texas. 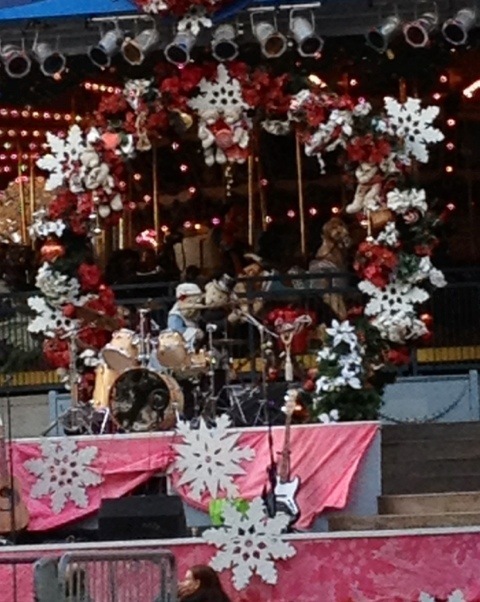 And it’s holiday in the park time. 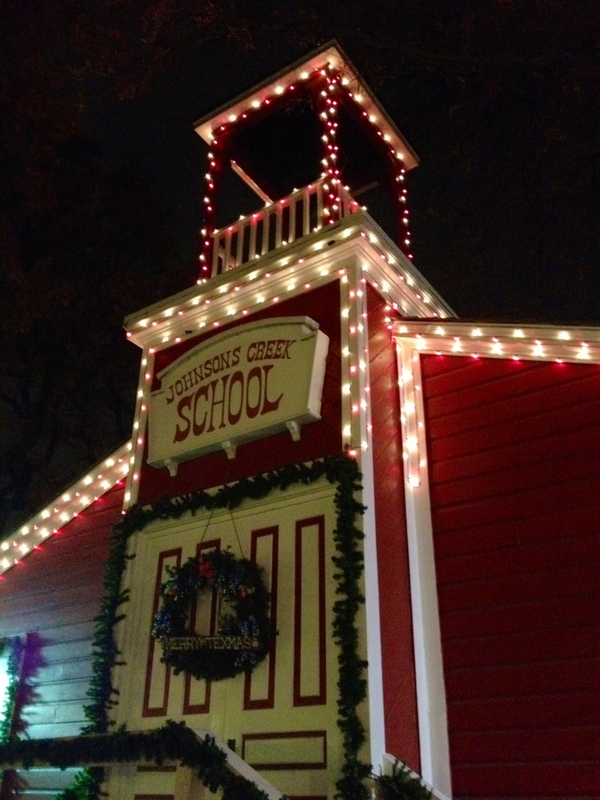 The park is decked out for Christmas (they even have Santaland – I know him! I know him!). We get there right before the park opens which is great. 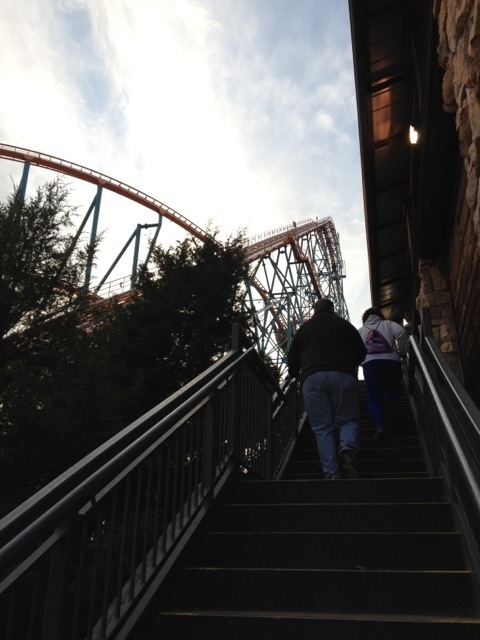 We have zero lines on some of the biggest ticket rides Six Flags offers. We may be a little over zealous in taking on the biggest ride in the park, literally right out of the gate, but let’s just say we couldn’t wait. 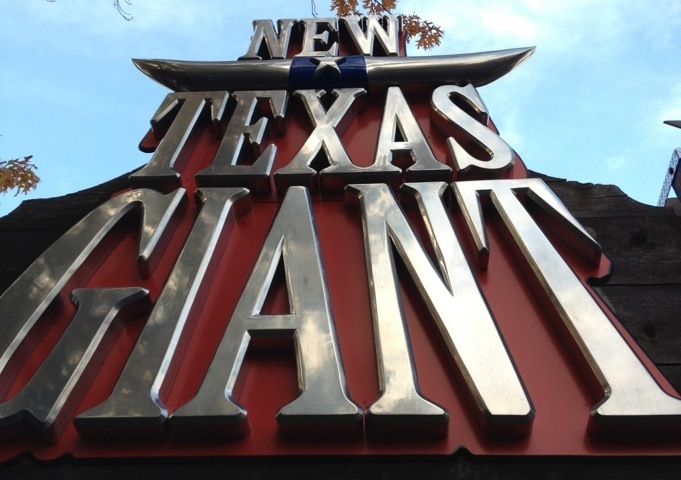 We hang on tight aboard The New Texas Giant as our first ride of the day. 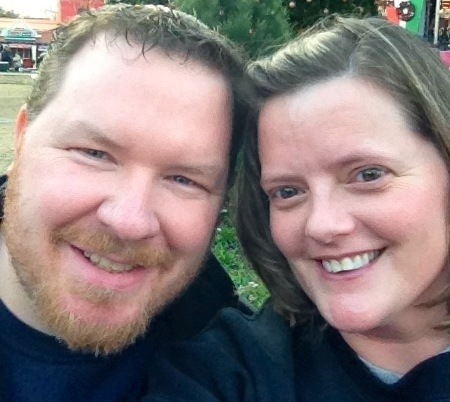 This is Jason’s first time on a roller-coaster ride in twenty years. I think it is well worth the wait. Fourteen stories high, with curves, and drops that would make any roller-coaster enthusiast proud. 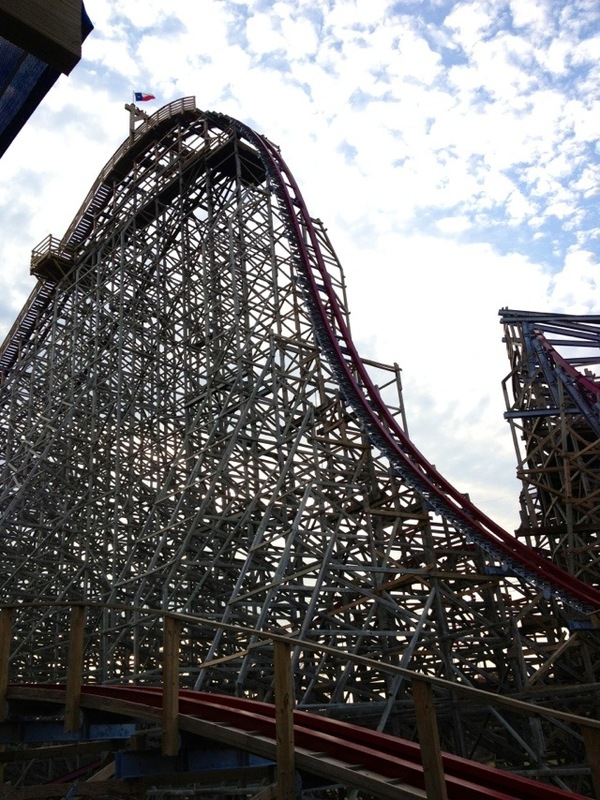 And it is not just a looker, this baby lives up to the hype of the steepest drop of any wooden coaster in the world. Hands-down, it is the best roller-coaster EVER. Standing in the shadow, but not to be outdone by all the hype is The Titan where we head next. The Titan is quite frankly a speed monster. 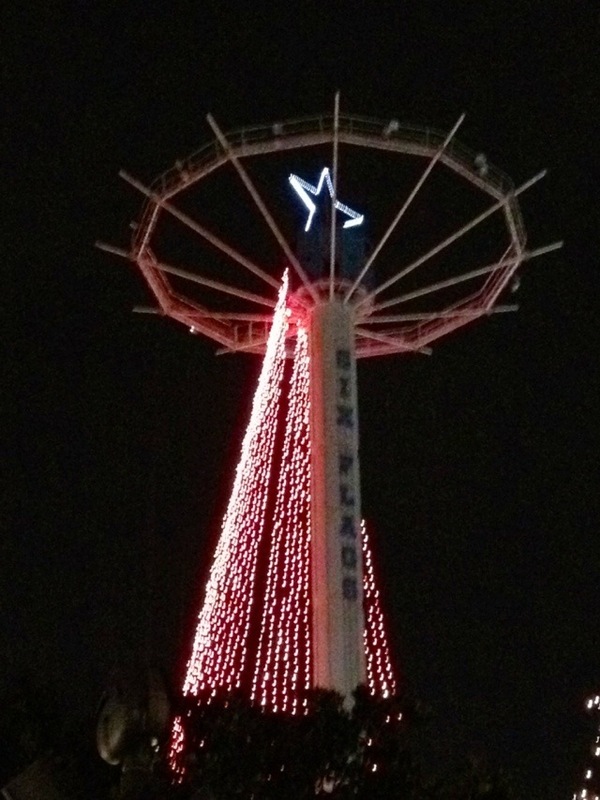 Twenty-five and half stories tall with speeds of up to 85mph per hour. This beast will make you shudder as you rise to the top of it. Then brace yourself as you WHIP through turn after turn on the cork-screw. Holy heck! 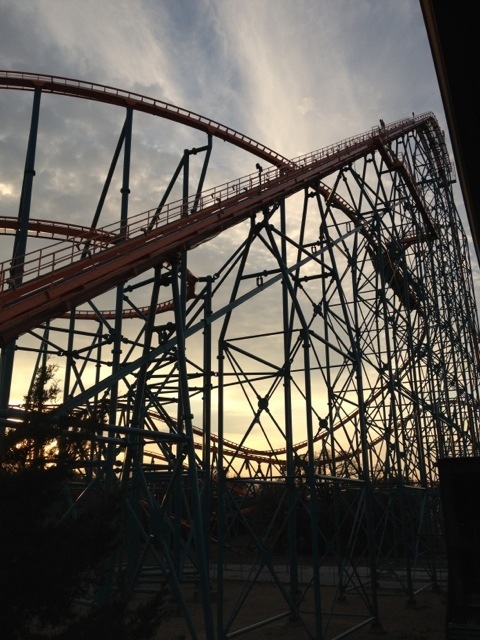 Another Texas-sized coaster. I am so proud to live here. I didn’t bring my big camera. I used my iPhone 4S. It does well in a pinch and if I can keep my hand steady. Today, not so much, but I (at least), tried to record the date day. 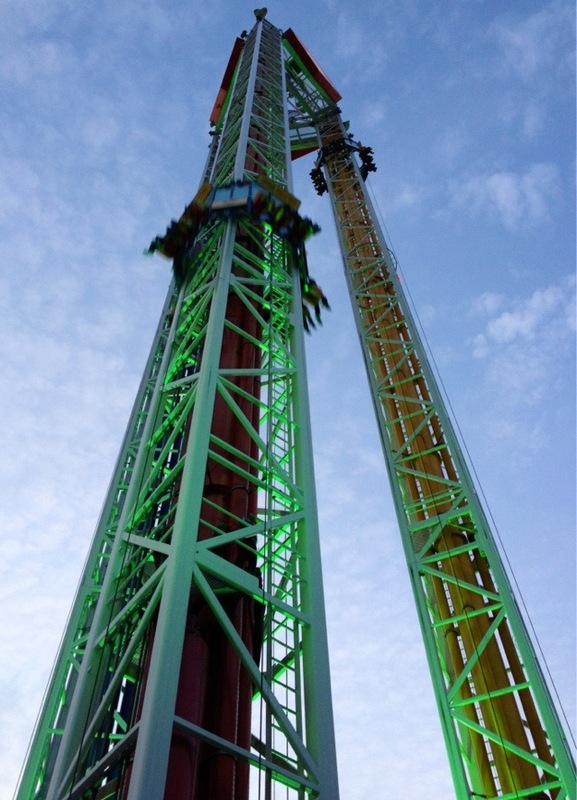 The next thing we rode was my nemesis – Superman Tower of Power. I fear this ride, and I don’t fear much (just ask my sister). Not the dark, not the witching hours, not haunted places, not strangers, or things under the bed. I don’t fear much. It gives me the heebie-jeebies. For one, I’m afraid of heights. For two, I am afraid of heights. For three, I am afraid of heights, and feet DANGLE in the AIR. Do you see that? Last time I rode this ride, I thought I was going to crawl out of my skin. I am ONLY riding it this time, for Jason – since he has never ridden it before – and, because I don’t like FEAR (stare fear in the eye). With a little breathing and a few moments of eyes closed and teeth clenched. I make it through the 32 1/2 story drop. Ick! I don’t like that ride. The lights are not pretty and it’s not fun. At. All. But I am proud of myself. 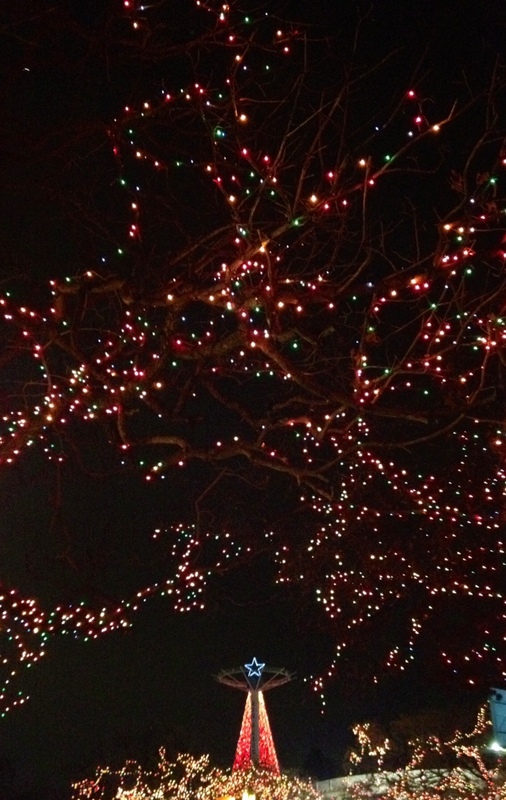 With the sun down, the holiday lights brighten the night. 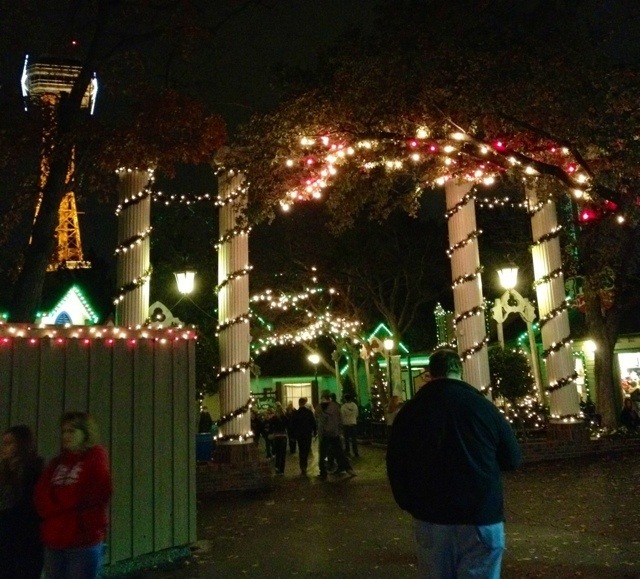 The park is beautiful dressed up for the holidays. We are really blessed to have free tickets that Sydney earned from working at Six Flags this summer and fall. 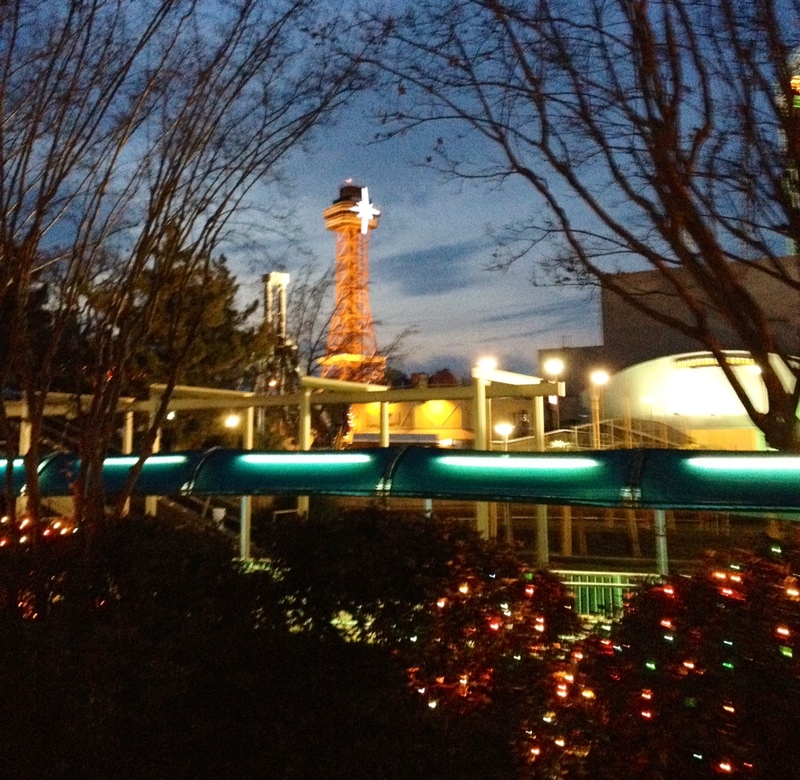 After a few more thrill rides, the lines get long, and we decide to call it a day. Definitely, a hardy holiday (ha). AWESOME! I love roller coasters and those ones look like the bomb!!!!!!!!!!!! 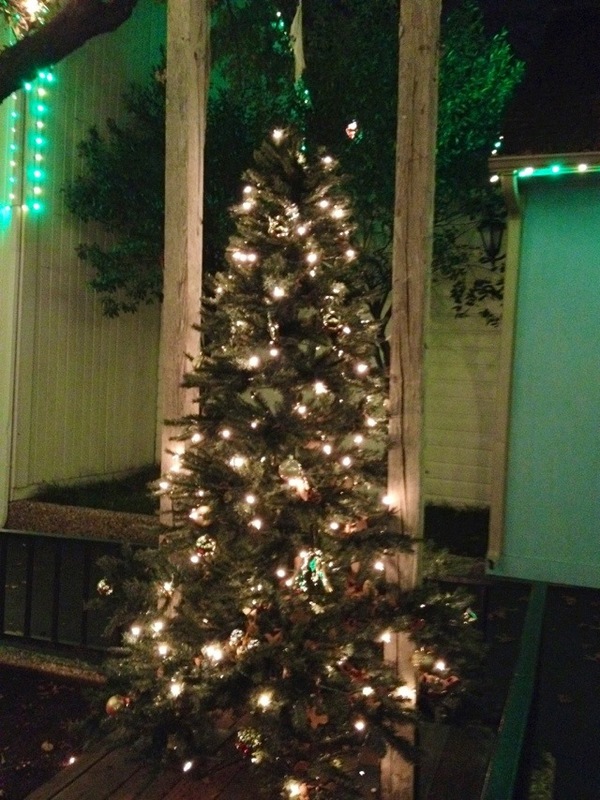 I also love Christmas lights and Christmas decorations! Wahoooooo! You went on the roller coaster ? You gotta be nuts. When going to fairs a corn on the cob, steak sammich and a Pepsi is all I need. The only ride is the one in the car to get there and leave. It looks like you had a great time! 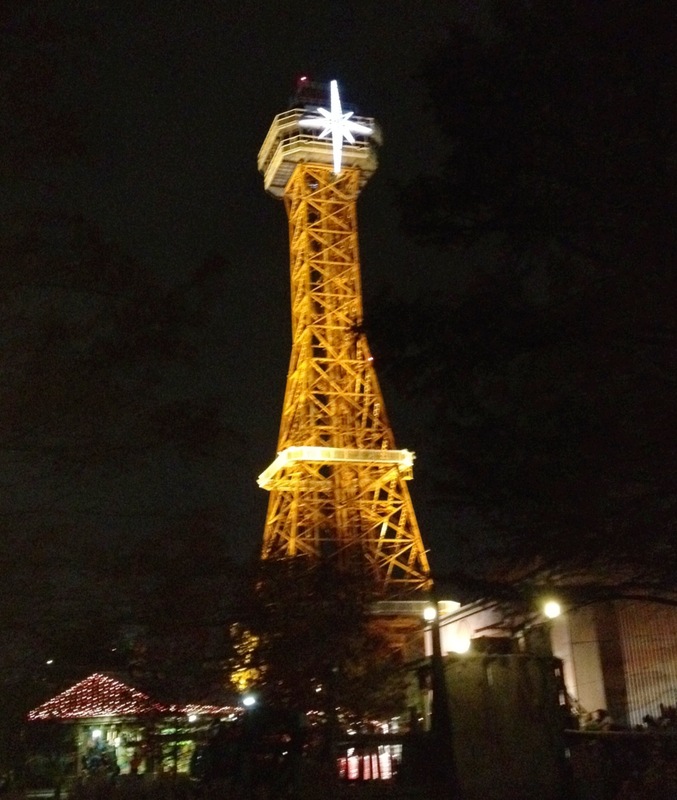 I love roller coasters too and can’t wait to visit Cedar Point one day! Ah, but a name is just a name – as in, “a rose by any name is still a rose” – right? Rollercoasters? Nope, nah, not in this lifetime. Super Tower? Nope, nah, not in this lifetime. Those things have edges, up high in the air, and my heart is weak. Okay, so it’s my courage that is weak, non-existent actually. But the trip would be worth it, at night, for the decorations. Lovely! 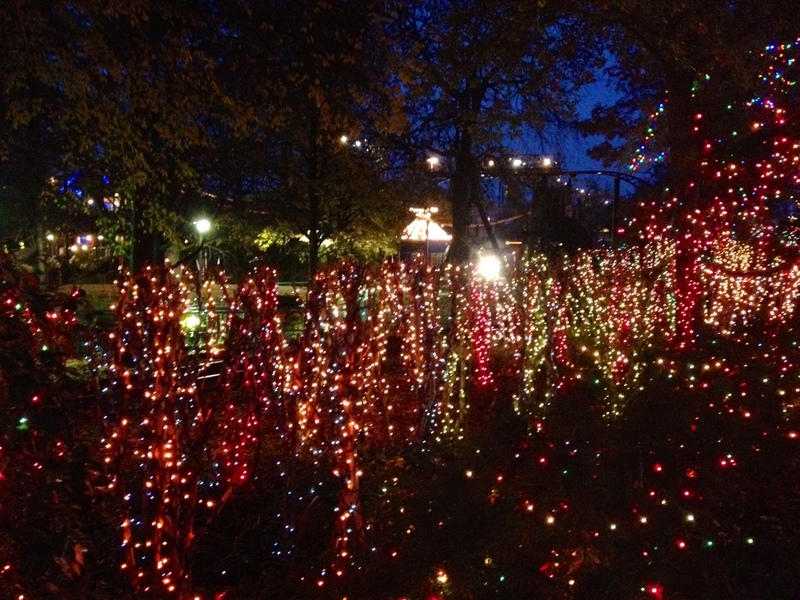 I really really need to get my kids to the zoo for the zoolights. 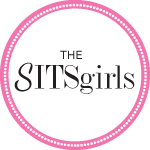 Your trip looks fun and fabulous!! 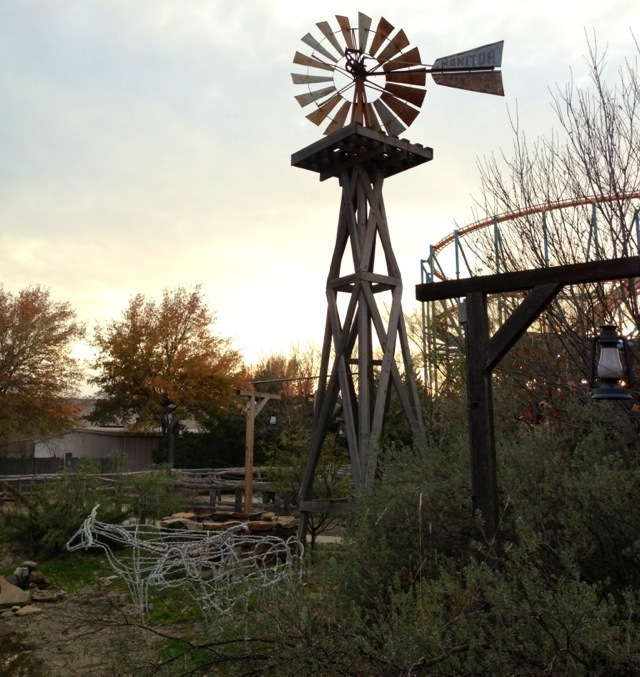 Oh Boy, my first roller coaster was a Texas sized one as well. I died. 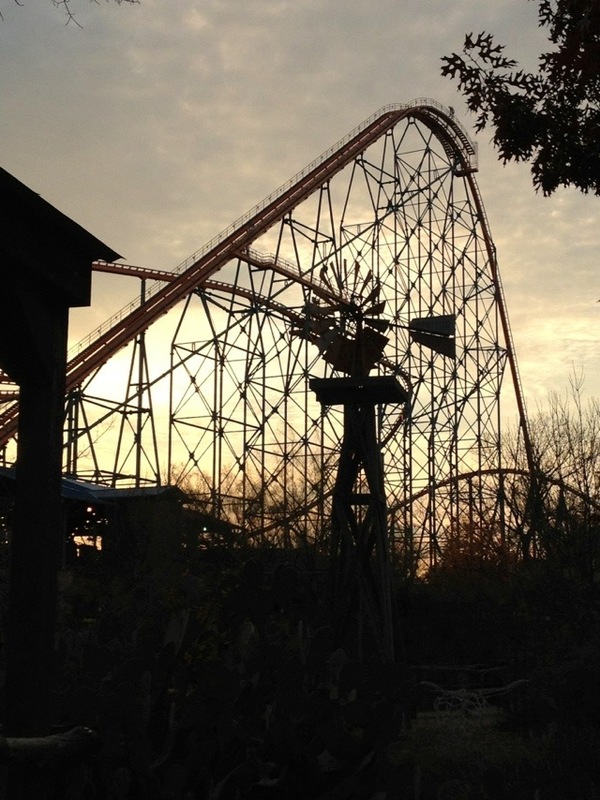 Great pics and I absolutely LOVE roller coasters. They are my favorite! 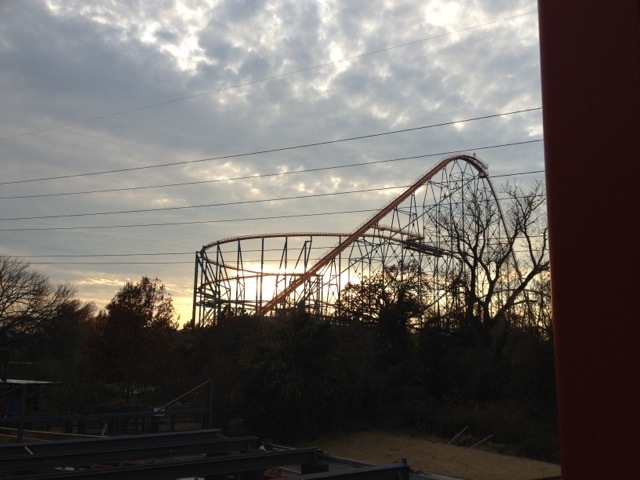 If yall ever get to Atlanta, Six Flags Over GA is the roller coaster “grave yard”. Any that close at other parks get moved here. It think they have over a dozen! Make you wanna SHOUT!!!! You rode that??? You are a brave woman. Sounds like you had a wonderful day! Brrrrrrrrrrrrrrrrrrrrrrrrrrrr, no way I will do that ever! I was a dare devil when I was young but now, I am such a coward, I hate that! You can be indeed proud of your self!! I love my 4S too, great pictures! 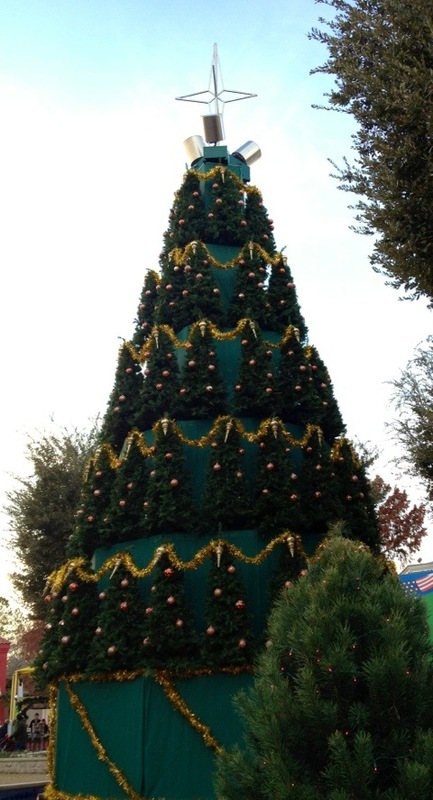 It’s so interesting to see Six Flags decorated for Christmas! We shut down here because it’s too cold. Thanks for sharing and great job meeting your fears head on! I see a day of roller coaster fun in our future!